The backchannel protection works at Elton backchannel were completed on 11th May 2018. We were lucky enough to experience some great weather over the course of the week, allowing the contractors to deliver the works without issue. Elton backchannel is one of the country’s leading barbel fisheries with some record wobbling fish being caught in recent years. The channel is in a generally good condition however an issue with sediment input and erosion has been contributing to the pressures on fish spawning and aquatic habitats. In order to protect the aquatic ecosystem the Resilient River project looked at two simple methods, a stronger, more secure fence line and the gating and dressing of the existing ford. Both of these techniques will alleviate sediment input in to the channel and keep spawning habitat in top condition. 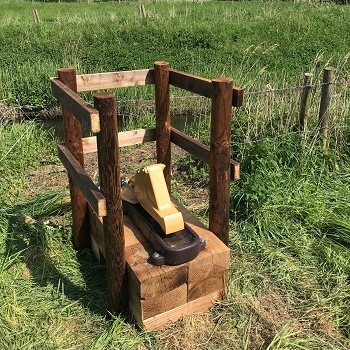 Overall over 600 metres of fencing was erected, which included some sturdy stiles for the anglers so they can still enjoy the fishing. The remedial works to the ford included the use of an excavator to batter the eroded banks back before a base layer of 100-150mm granite was laid down with a top dressing of 4-20mm crushed granite was ‘tracked in’. This provides the cattle with a comfortable base to walk on when they are moved across the channel. In addition to this a water supply was required on the left hand bank so 3 pasture pumps were installed for the cattle to drink from. These devices are a very low maintenance way of providing water for cattle as the cattle operate them by pushing the pump with their nose as they drink from the small trough. 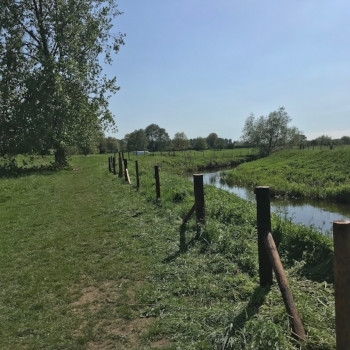 We would like to thank the staff at Countrywide Fencing for their superb and quick work even through some seriously hot weather, Elton Estates for allowing the scheme to go ahead and the Heritage Lottery Fund and Environment Agency for providing funding to make the Resilient River scheme possible.